1. There were 11 similar murders at the time of the Jack the Ripper Killings. There are 11 murders in the Whitechapel Murder file but Jack the Ripper is generally agreed to have only killed five victims (The ‘canonical five’). These are Mary Ann Nichols, Annie Chapman, Elizabeth Stride, Catherine Eddowes and Mary Kelly. 2. Jack the Ripper killed primarily at weekends or public holidays. 3. Jack the Ripper almost got caught. He came close to being caught on several occasions a neighbour likely heard the murder of Annie Chapman occur, he was possibly disturbed in the act of killing Elizabeth Stride, and Catherine Eddowes murder occurred in a short window between police beats. 4. Jack the Ripper took souvenirs from his victims. He took organs from several of his victims – Annie Chapman’s uterus, Catherine Eddowes uterus and kidney and some believe Mary Kelly’s heart. Letters sent to the police claim that he ate these. 5. Jack the Ripper’s name was an invention of the media. The name Jack the Ripper comes from a letter claiming to be from the killer sent to the Central News Agency on September 27th 1888. However, it is generally agreed that it is a press invention by a journalist keen to keep the story going. 6. 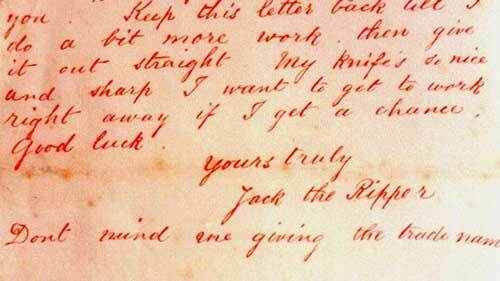 Lots of people wrote letters claiming to be Jack the Ripper. The police received hundreds of letters claiming to be from the killer. Nearly all of these are considered to be pranks. The one that stands out as being potentially real was sent to George Lusk of the Whitechapel Vigilance Committee with a parcel containing half a human kidney. 7. More than 100 people have been accused of being Jack the Ripper. These include lunatics, politicians, artists, writers, police officers, doctors and even royalty. 8. Criminal profiling started with the Jack the Ripper case. The Jack the Ripper case featured the first known example of a criminal profile, compiled by Dr Thomas Bond following the murder of Mary Kelly. 9. It was also the first time crime scene photography was used in Britain. The Jack the Ripper case is the first known example of crime scene photography in Britain – Mary Kelly’s murder scene. Previously photography had been used solely to help identify victims. 10. Mary Kelly was so mutilated she was almost unrecognisable. The mutilations on Mary Kelly were so severe that a preliminary post mortem taking several hours had to be conducted with the body in situ, and her ex lover Joseph Barnett could only identify her by “the ear and her eyes”. 11. They thought the eyes of the victim might reveal Jack the Ripper’s identity. It was believed that the eyes of the deceased would contain an image of the last thing they saw (like a photograph negative). An attempt was made to photograph the eyes of the victims in order to see if an image of the killer was captured. 12. Doctors could not agree on the level of medical or anatomical knowledge displayed in the killings. Some felt the skill demonstrated was that of someone with medical trainings, other thought a butcher and some thought no special skill or knowledge was present. 13. The paranoia in Whitechapel at the time was at breaking point. The paranoia at the time was so strong that on several occasions where criminals were witnessed being arrested for unrelated offences, they were nearly lynched by angry mobs for being Jack the Ripper. Horror comedy mixed to perfection as Landis reinvents werewolf movies and Rick Baker creates monster-making history.